When an economy is healthy, there is lots of buying and selling and money tends to move around quite rapidly. Unfortunately, the U.S. economy is the exact opposite of that right now. 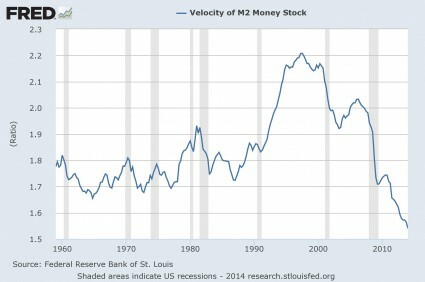 In fact, as I will document below, the velocity of M2 has fallen to an all-time record low. This is a very powerful indicator that we have entered a deflationary era, and the Federal Reserve has been attempting to combat this by absolutely flooding the financial system with more money. This has created some absolutely massive financial bubbles, but it has not fixed what is fundamentally wrong with our economy. On a very basic level, the amount of economic activity that we are witnessing is not anywhere near where it should be and the flow of money through our economy is very stagnant. They can try to mask our problems with happy talk for as long as they want, but in the end it will be clearly evident that none of the long-term trends that are destroying our economy have been addressed. Discussions about the money supply can get very complicated, and that can cause people to tune out, but it doesn’t have to be that way. To put it very basically, when there is lots of economic activity, there is lots of money changing hands. When there is not very much economic activity, the pace at which money circulates through our system slows down. That is why what is happening in the U.S. right now is so troubling. This is a highly deflationary chart. It clearly indicates that economic activity in the U.S. has been steadily slowing down. And if we are honest, we have to admit that we are seeing signs of this all around us. Major retailers are closing down stores at the fastest pace since the collapse of Lehman Brothers, consumer confidence is down, trading revenues at the big Wall Street banks are way down, and the steady decline in home sales is more than just a little bit alarming. Never before has such a high percentage of men in their prime years been so idle. But since they are not counted as part of “the labor force”, the government bureaucrats can keep the “unemployment rate” looking nice and pretty. Of course if we were actually using honest numbers, the unemployment rate would be in the double digits, our economy would be considered to have been in a recession since about 2005, and everyone would be crying out for an end to “the depression”. And now we are rapidly approaching another downturn. In my recent articles entitled “Has The Next Recession Already Begun For America’s Middle Class?” and “27 Huge Red Flags For The U.S. Economy“, I detailed much of the evidence for why this is true. And those that run the Federal Reserve know all of this. 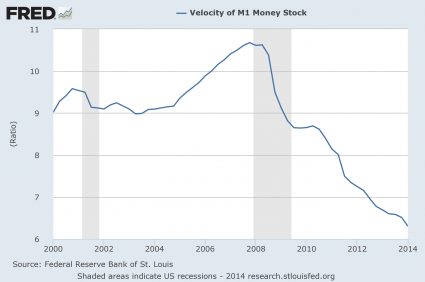 That is one of the reasons for all of the “quantitative easing” that they have been doing. The folks at the Fed know that the U.S. economy would probably drift into a deflationary depression if they just sat back and did nothing. So they flooded the system with money in a desperate attempt to revive economic activity. But instead, most of the new money just ended up in the pockets of the very wealthy and further increased the divide between those at the top and those at the bottom in this country. And now Fed officials are slowly scaling back quantitative easing because they apparently believe that the economy is getting “back to normal”. Many are not quite so optimistic. For example, the chief market analyst at the Lindsey Group, Peter Boockvar, believes that the S&P 500 could plummet 15 to 20 percent when quantitative easing finally ends. Others believe that it will be much worse than that. Since 2008, the size of the Fed balance sheet has grown from less than a trillion dollars to more than four trillion dollars. This unprecedented intervention was able to successfully delay the coming deflationary depression, but it has also made our long-term problems far worse. So when the inevitable crash does arrive, it will be much, much worse than it could have been. Sadly, most Americans do not understand these things. Most Americans simply trust that our “leaders” know what they are doing. And so in the end, most Americans will be completely blindsided by what is coming.